Excited for Fall but can’t let go of Summer? I’m so excited for all things pumpkin, but am hanging tight to my last days of sunny warm weather and occasional thunderstorm evenings, which I love! Nothing like the sound of rain and thunder to make me sleep like a baby. 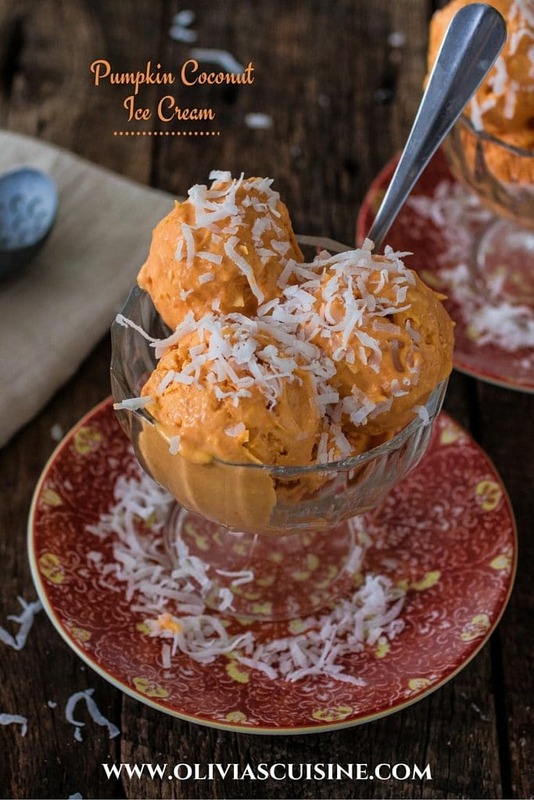 But to satiate my pumpkin cravings, I decided to bring together the best of both worlds in a delicious and decadent Brazilian-inspired Pumpkin Coconut Ice Cream! 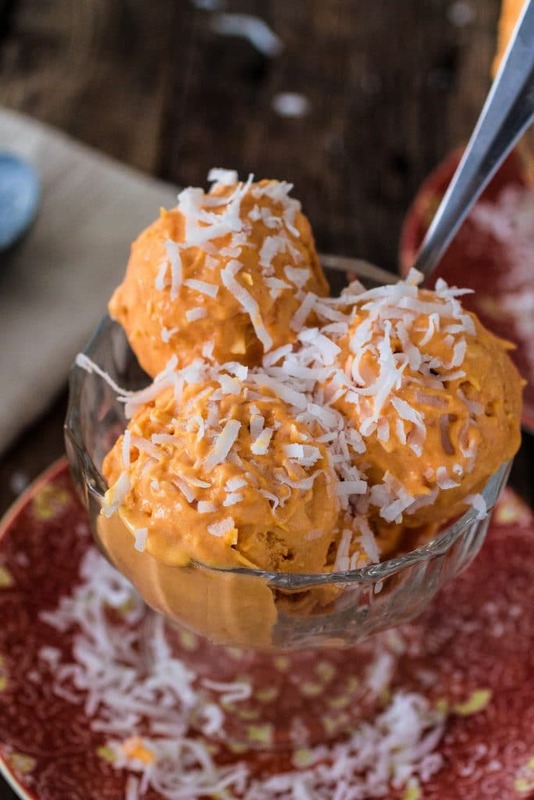 Pumpkin and coconut is a very popular combination in Brazil. We mostly eat it as a compote, with cheese, but you will find lots of desserts that play with these wonderful flavors. For last year’s Halloween, I made Pumpkin and Coconut Brigadeiros that I attempted to shape like little pumpkins. They were adorable and delicious, but a bit on the sweet side. This time I didn’t go too heavy on the sugar so that we would be able to taste all the flavors in the ice cream, instead of just an explosion of sweetness! To be completely honest, I did feel tempted to add just a tad more sugar, but I had to think of my husband, who likes way less sugar than me. I think I found a perfect balance and he was crazy about the results, so I guess that settles the sugar battle. I also didn’t add any spices – cloves and cinnamon are usually associated with pumpkin in Brazil – because I wanted to keep it summery and fresh. Feel free to spice it up to your likings if you want some more Fall flavors in this hybrid dessert. Just don’t skip the shredded coconut. It adds an amazing texture and the flavors go really really well together. If you haven’t tried pumpkin with coconut, now is the time, my friend! I was happy I got to use my ice cream machine (which is actually a Kitchen Aid attachment) again, considering I haven’t made any homemade frozen treats since May, when I made Avocado Ice Cream. I was also specially glad that someone decided to store the ice cream bowl in the freezer when we were unpacking the kitchen boxes! Because I obviously only thought of it at the last minute, when I was done making the custard and was like “OH NO! THE ICE CREAM BOWL NEEDS TO BE FROZEN!”. So I ran to the freezer to check and there it was, all cold and frosty! :-) Thanks, Mom! And speaking of my mom, she left back to Brazil last week. :-( After a whole day of crying and the usual “What the heck am I doing in another country?”, I am now feeling a little better, but you can definitely expect lots and lots of comfort food coming your way. Especially PUMPKIN comfort food. Because I have about a million pumpkiny ideas on my mind! Mix the pumpkin purée and the vanilla extract in a bowl. Bring to the fridge to chill while you work on the other ingredients. In a saucepan, simmer the heavy cream, milk, salt and sugar until the sugar dissolves completely, about 5 minutes. Remove saucepan from heat. In a separate bowl, whisk the egg yolks until smooth. Whisking constantly, pour 1/3 of the hot cream into the yolks and then whisk the yolk mixture back into the saucepan with the cream. Return the pot to the heat and cook over medium low heat, stirring constantly and keeping the custard at a low simmer, until it thickens (it should be thick enough to coat the back of a spoon), about 5 minutes. Strain the custard through a fine-mesh sieve into a bowl and place the bowl into a larger bowl partially filled with iced water, to cool it to room temperature. Whisk the pumpkin purée into the custard. Cover the bowl with plastic wrap, pressing it directly on the surface of the custard to prevent a skin from forming. Bring to the fridge and chill for at least 4 hours or overnight. Churn in an ice cream machine according to manufacturer's instructions, adding the shredded coconut during the last 2 minutes of churning. Serve immediately for soft serve or store in freezer until desired consistency! « Casarecce Siciliane with Gorgonzola, Walnuts, Arugula and a touch of cream! Combining summer and fall is a great idea- especially when it involves ice cream! Punkin AND coconut IN ice cream? LOVE this, Olivia! Super clever! While I am sorry you are sad your mom left, I KNOW you two had a great time while she was here! And I’m glad you are feeling a little bit more chipper! Anyways, pinning this delicious creation! Cheers, girlfriend! What a perfect recipe to combine the new and old season. 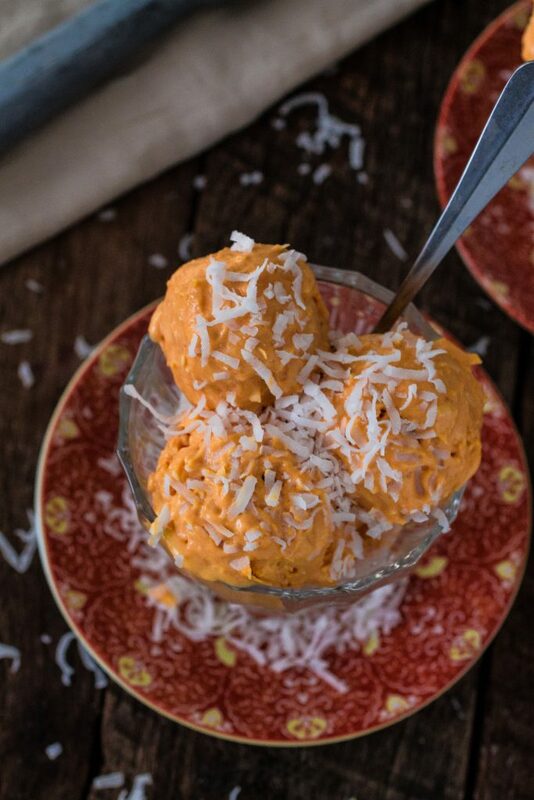 A pumpkin and coconut ice cream sounds divine! Pumpkin coconut ice-cream? WOW! This is brilliant. I am loving all the gorgeous and deeeelicious flavors here. Just YUM! I never thought of making a vegetable ice cream :) But tried this one out and it is bloody delicious! I didnt have a vanilla extract by hand, so I used an orange extract, which gave it nice fruity aroma. Thanks for sharing this!